One satisfying thing about banding birds is that the technique provides a much closer view of our avian subjects than is offered the typical birdwatcher. Birds are amazing enough through binoculars or spotting scope, but in the hand our fascination with avian creatures increases exponentially. Up close, the intricate structure of feathers is revealed, seldom-observed attributes such as brood patches can be seen, and even tiny ticks and other parasites provide greater understanding of environmental factors birds encounter on a day-to-day basis. All these are indeed wondrous things to behold, but to us one of the most curious aspects of birds up-close is the differences in their eyes. Some birds--including the White-eyed Vireo (above) and the Red-eyed Vireo (below)--are even named for their easily viewed eye colors, but with the help of a hand lens we see far more detail in these birds' eyes than is otherwise possible. 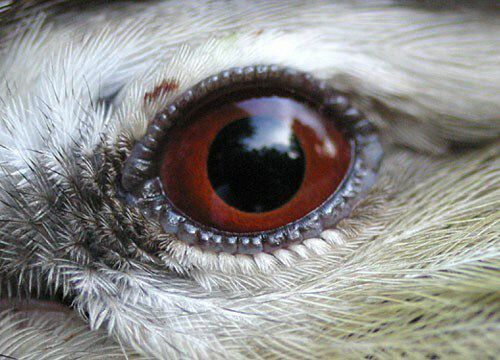 Exceedingly uncommon in the bird world are the ghost-like eyes of the White-eyed Vireo (WEVI); a magnified view shows the iris appears to contain white granular material and that the outer edge is laden with pink blood vessels. This is very different from the iris of the Red-eyed Vireo (REVI), laden with red pigment. Curiously, young WEVIs actually start out with muddy, gray irises that gradually become crystal-clear and white. Juvenile REVIs have irises that are brownish and muddy. The REVI below is a second-year bird hatched in 2002 and banded this week; its eye likely will darken, redden, and clarify further over the coming months. Indeed, most young birds have irises that are different in hue and clarity than adults of the same species--a phenomenon nicely illustrated in a series of Sharp-shinned Hawk photos (below). Although these are three different birds, they show the gradual shift from light to dark that is typical of some bird species. (A similar change from yellow-orange to red occurs in Eastern Towhees, although some individuals we've retrapped in successive years never demonstrate the phenomenon. In some coastal and southern populations, the iris is white in adult towhees.) We suspect the change in iris color over time provides evidence of a bird's age--important, for example, when a mature female's reproductive potential is enhanced by her selection of an older and therefore healthier and more "worldly wise" father for her offspring. A recently fledged Sharp-shinned Hawk, Accipiter striatus, has an iris that is pale lemon yellow (left). Sometime by the end of its first winter . . . . . . the sharpie's eye usually begins to turn pale orange (left). And by the time it is a mature adult--usually by its third year--the Sharp-shinned Hawk typically sports a very different plumage (right) and an eye that is deep red in color. 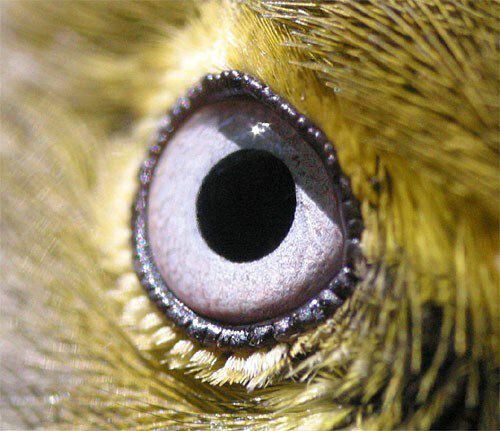 A bird's iris includes millions of pigment cells. These, in turn, contain a variety of compounds--especially melanin--and other substances such as colored oils and guanine. All these substances work in combination through reflection, refraction, and scattering to give each bird its unique eye color. In albino birds, pigment cells lack pigments entirely and the underlying blood vessels make the iris appear pink. In some bird species, eye color also may be determined by hormonal changes--as when the iris of a Brown Pelican becomes powdery blue during the breeding season. 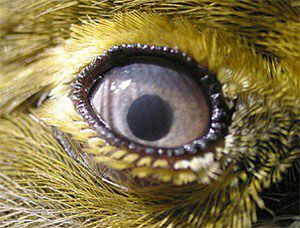 In birds the nictitating membrane is especially useful because these winged organisms typically spend lots of time flying. In the air, even momentary loss of vision caused by closed eyelids might throw a bird off balance, causing it to plummet earthward. 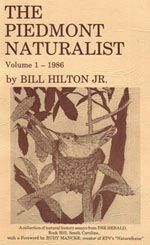 And isn't it great that birds such as falcons--which intentionally dive at high rates of speed--can protect their eyes from the rushing wind simply by closing their nictitating membranes, or that loons and ducks have a clear central lens in the membrane that allows them an undistorted view when swimming underwater? As typical birds, White-eyed Vireos have nictitating membranes, and a comparison of the top photo and the one at right shows just how different the bird's view of the world must be when--as is shown here--the membrane has nearly finished sweeping back to cover the eye. All birds have round pupils, except for the Rhyncopidae, which includes the Black Skimmer found in coastal regions; this family has pupils that are cat-like and become narrow vertical slits in bright light. 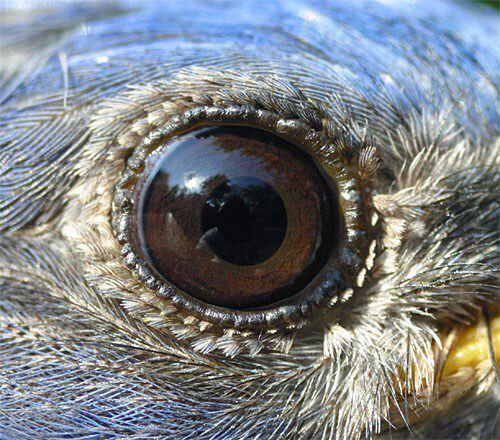 Regardless of the species, it's really hard to see the white of a bird's eye because pupil and iris essentially fill the exposed portion of the avian eyeball. 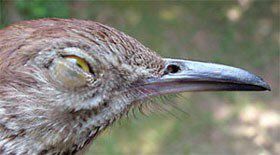 Curiously, some birds such as Brown Thrashers apparently can "see" even when their eyes are closed, since the eyelid itself is unfeathered, thin, and semi-transparent (left). The thrasher also demonstrates that in birds the bottom eyelid moves upward--opposite of the way the lids work in humans. The various close-up images on this page likewise reveal that just as humans have modified hairs that line the eyelids and filter out dust, birds have short, bristly feathers that serve the same function. The bird's eye is undeniably one of the most interesting structures visible to bird banders here at Hilton Pond Center, including when we handle Eastern Bluebirds (adult male below). Thus, we're sure you'll understand why we say that within the Aves, the "eyes" have it. 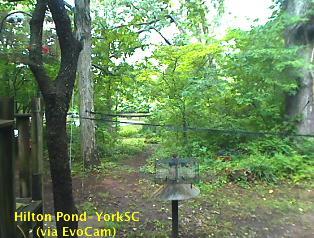 Transmission of weather data from Hilton Pond Center via WeatherSnoopfor Mac. --Another inch of precipitation on 26 Apr meant Hilton Pond was still losing water over the spillway, an historically rare occurrence that has been going on for more than a month due to heavy later winter and spring rains. From all appearances, the spring that once fed the pond but went dry more than 20 years ago has been rejuvenated. 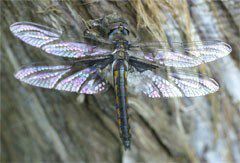 --A Common Baskettail, Epitheca cynosura (above), seen on 28 Apr became the ninth identified dragonfly species at Hilton Pond Center. During the week we also spent a good deal of time safely removing several large Swamp Darter dragonflies, Epiaeschna heros, from mist nets intended to catch birds. --A Common Snapping Turtle trolling the surface of Hilton Pond on 30 Apr was highly visible because of a layer of yellow clay caked on its shell.